My Dad Was a Fantastic Cook. Mom didn’t really like to cook. She’d manage to put meals on the table during the week though, because that’s what moms did. My Dad, my brother and I grew up with Mom’s nearly inedible meals most weekdays—things like over-salted and over-cooked hamburger “steak,” canned peas and instant mashed potatoes. My Mom had embraced the convenience food-trend of the 70’s like many other moms in those days. Pre-prepared and pre-packaged foods took off in a big way and Mom was on that band wagon, for sure. So it wasn’t too much of a surprise to my brother and me when Dad started doing most of the cooking for the family when he retired. I was still in high school at the time. Even before he retired, I remember really looking forward to the weekends, when Dad would take over the kitchen and make elaborate breakfasts—fried potatoes with onions, big, fat, overstuffed omelets and thick, meaty bacon. Hank rocked it in the kitchen. He caught it. I ate it. My Dad Ate Weird Things. It was not unusual to walk into the “tv room” on a weekend afternoon and see Dad watching a football game while noshing on a limburger cheese sandwich with raw onions on pumpernickel. Or “rollmops”—a gherkin wrapped in pickled herring. He often subjected us to the weirdness at dinner time. When he cooked, we were served things like sauerbraten, beef tongue, steak and kidney pie and black pudding. My Dad was not like other dads. 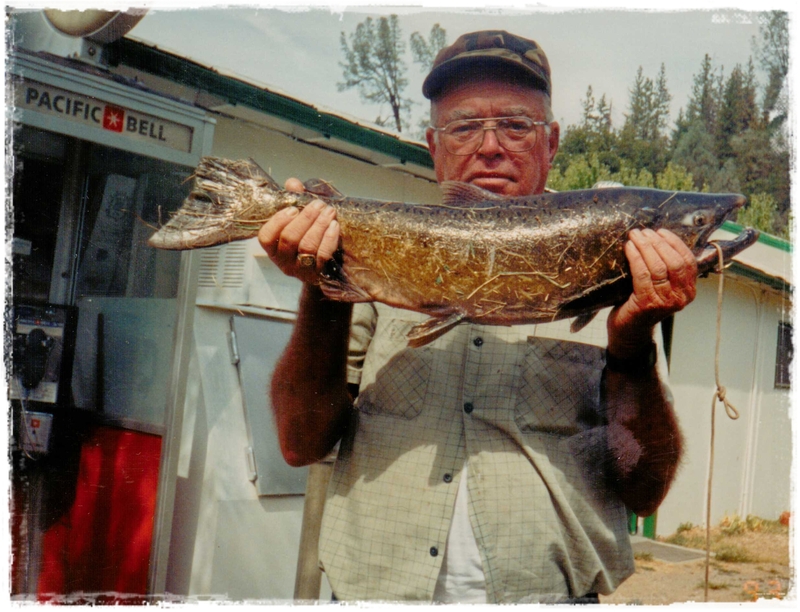 He spent his weekends making jams and jellies (often from the fruit in our own yard), smoking salmon and trout that he caught himself and making venison jerky from the deer he brought home from his hunting trip. He would do odd things like harvest the rhubarb plant in the backyard and make a pie filling out of it. Some weekends he’d butcher some of the ducks and rabbits that we kept in the back-forty. MMMmmmm . . . I loved hasenpfeffer. Not so much the czernina. 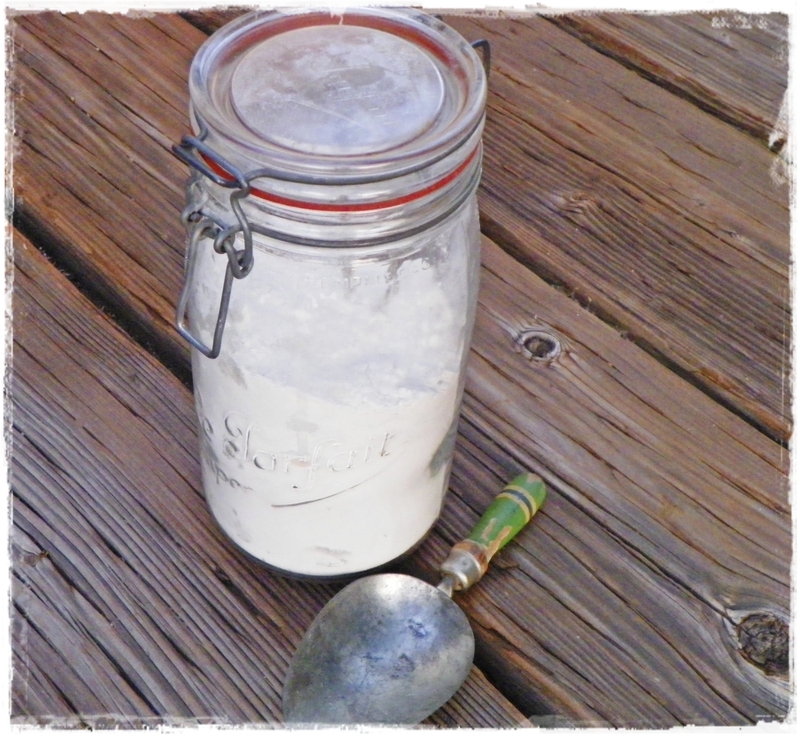 And there was always a jar of sourdough starter in the fridge. I still have the old jar, but not the starter. Now it’s filled with flour. I love that jar. My Dad Wasn’t Afraid to Experiment and Try New Things. Shabu shabu dinner. Note the look on Mom’s face. Hank was a renaissance man. He was rolling sushi in the late 70’s, before sushi was even a “thing” in the American culinary scene. When I was in high school, our family hosted foreign exchange students from Japan. Dad impressed them by rolling sushi with fresh ahi and salmon and cooking dinner outside on the picnic table with a shabu shabu pot. It was no inconvenience to him to drive 40 miles to the beach area for fresh, sushi grade fish. It was an adventure. Hank went out of his way to expose my brother and me to new flavors and tastes. I loved trying new things and he knew that. My brother and my Mom—not so much. I remember when I was about 10 years old, my Dad wanted to make a special dinner for my Mom for her birthday. Mind you, Mom was a basic “meat and potatoes” type of woman–not real keen on funky flavors or trying new things. My Dad made a beautiful prime rib for the main course. Delicious . . . and safe. I don’t remember what he made for the sides or even the dessert, but for the starter, he made vichyssoise. Weird name. I was intrigued. Turns out, it really wasn’t anything wild. 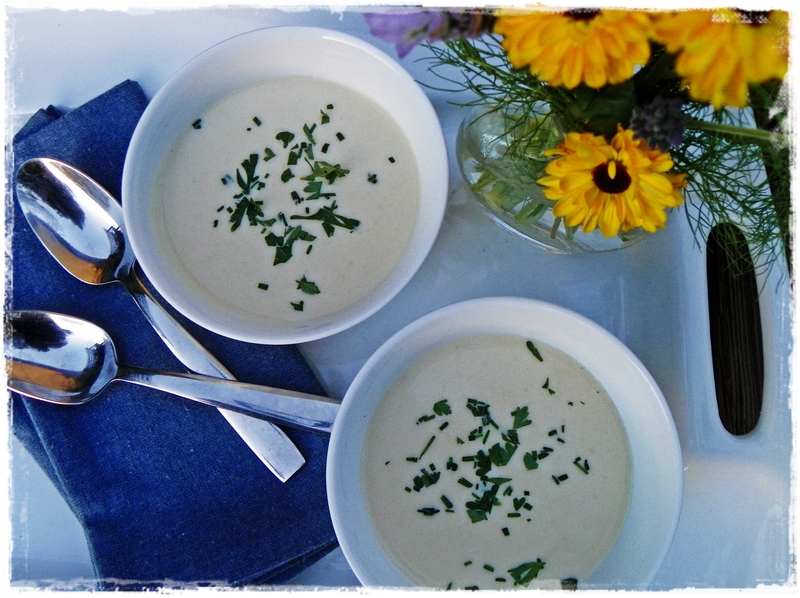 Vichyssoise is just a soup made of puréed leeks, potatoes and chicken stock, traditionally served cold. Dad got the recipe straight from Julia Child’s Mastering the Art of French Cooking. That was my first “encounter” with Julia Child. I was excited to try this soup with a funny name. It must be exotic! Mom’s response when she tasted the velvety smooth, cold bowl of creamy goodness? She scrunched up her nose (see the shabu shabu photo above) and said, “It tastes like cold potato soup!” My poor Dad looked defeated. From that moment on, I vowed to try anything and everything. Be bold! 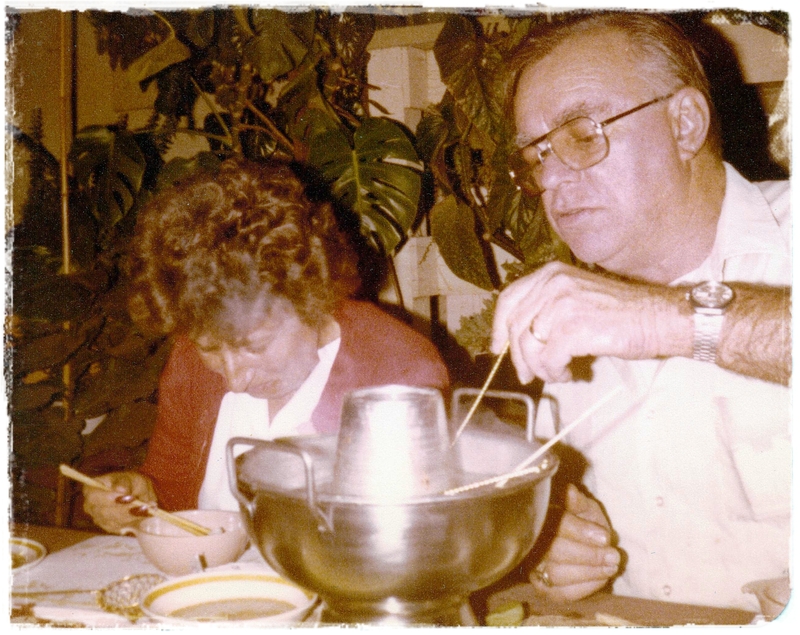 I was always eager and happy to benefit from my Dad’s culinary experimentation—and I took full advantage of learning from him. Dad Taught Me That Food is Comforting; Food is Love. I learned early on that is it always satisfying to make someone happy, and the easiest way to make someone happy was to feed them good food. Comfort food. People often ask me what kind of food I like to cook, or what my “specialty” is. For me, it’s all about home cooking. Simple comfort foods that evoke happy memories and fill your soul, as well as your stomach. My favorite childhood food memory is making Thanksgiving dinner in my parents’ kitchen with Dad. Every year, the turkey was perfect, the stuffing was always cooked inside the bird, the mashed potatoes were always lumpy (my Mom’s only contribution to the meal), and the gravy was always rich and smooth. Dad would always make a double batch of oyster dressing and hand a big hot dish of the good stuff over the back wall to the neighbors next door. They were from the East Coast and missed the oyster dressing that was traditional for them. Hank was happy to help them out. When the turkey was out of the oven, Hank would always peel off some of the crispy skin and we would sample it together. People still ask me for Hank’s gravy recipe. And I still sneak a piece or two of the crispy skin from the perfectly roasted turkey before it’s carved. People and Your Relationships With Them Are the Most Important Things in Your Life. My Dad told me that if I tried, I could learn something from every single person I met in life. I didn’t really take him very seriously at the time—I was just a kid. I always knew and understood that family relationships were important. But I’ve also grown to understand that family, friends, and even acquaintances can and will teach you life lessons. Break bread and enjoy a glass of wine with the people in your life. Listen to them. Listen to their stories. Watch their actions and how they respond to joy, grief, love and fear. That’s how you learn things. That’s what shapes you. Dad never smiled in pictures. But he was always smiling on the inside. Hank is my adoptive father. I do not know a single thing about my biological father. Biology doesn’t matter to me . . . you can make a family whether or not there is a biological connection. It happens every day. It’s the best part of life. I love you, Dad! 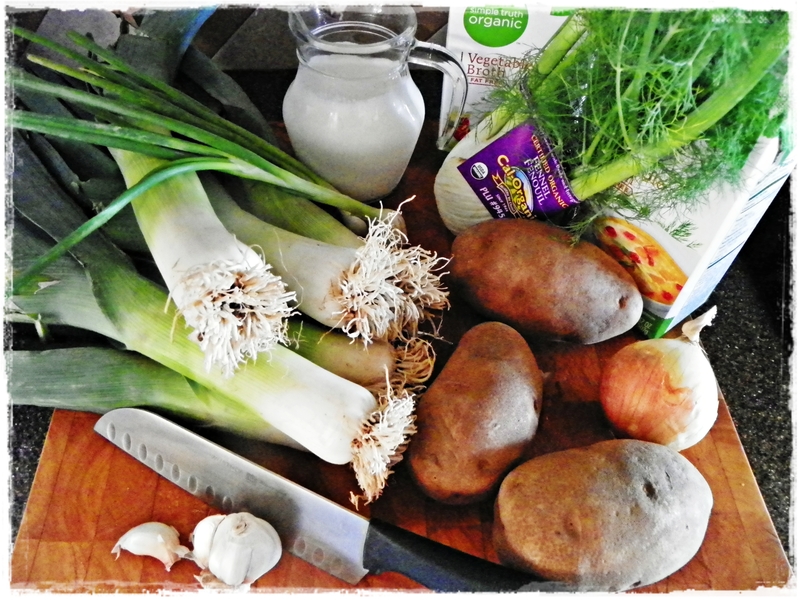 Here is the recipe for Vichyssoise, but I’ve given it my own twist by adding fennel and garlic. It’s a refreshing cold soup, filling and satisfying. Cook the potatoes in salted water until just tender. Drain and set aside. Melt the butter in a stock pot over medium heat. Add the leeks, fennel, garlic and salt and sauté for 5-7 minutes. Do not let the vegetables brown. Add the broth and bring to a boil. Lower the heat and simmer the leeks and fennel are until tender. Add the potatoes to the leeks and the broth and season to taste with salt and pepper. 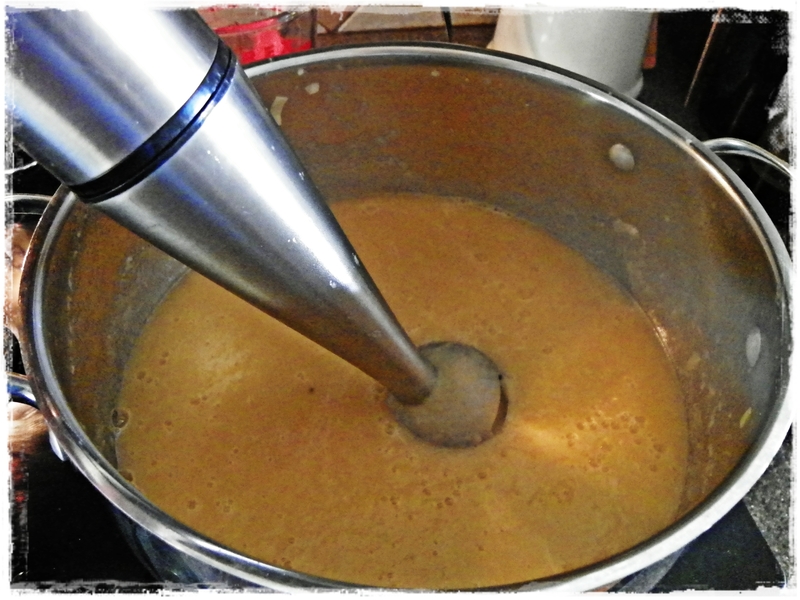 Transfer the mixture to a blender or use an immersion blender and puree the soup until smooth (if you are using a blender, you will need to blend it in batches). Chill the soup. When ready to serve, mix in the cream and garnish with chopped herbs. What a beautiful tribute! I thought my grandpa was the only man that ate onion and limburger cheese on pumpernickel!! Just the smell of that cheese alone reduces me to tears because it reminds me of him. Thanks, Heather! I have to admit, I never warmed up to the Limburger cheese! Thanks, Nancy! I wish you had known him. You would have enjoyed his wit (and his cooking). Beautiful story, Laureen — I’m sure you brought as much to Hank’s life as he brought to yours. Thank you, Janice! I sure miss him! He would have loved the contests and the travel, too! I LOVED that! I have always enjoyed listening to you talk about your Dad and how he was the inspiration for your love of cooking. What a beautiful testimony to him and thank you so much for sharing! Thank you, Michele! I know you had a wonderful dad that influenced you, as well. Happy Father’s Day! What a great story, Laureen. Perfect tribute to your dad and a great gift to have such a wonderful father. Thanks for the sweet words, Pam! Laureen, what a beautiful story and tribute to a wonderful man. He was certainly one-of-a-kind and so was your mom Little. Thanks for taking me down memory lane. Thank you, Ruth! I think of you often when I think of the old days with Mom & Dad. I’m so happy to be in touch with Steven and his family–they are such wonderful “kids!” I know you are proud! I’ve heard you talk about your dad so often I feel like I know him. He definitely influenced you in more ways than one… all positive! So what have you learned knowing me? No wait. Don’t answer that! LOL Love you! LOL, Lisa! I have learned A LOT from you! 😉 Love you! Such a sweet story. Thanks for sharing it with us. I remember being very young and sharing sardines and crackers with my dad. I didn’t love them, but I loved him and would have shared anything with him. Sounds like you felt the same about your dad. As a footnote, when my husband’s beloved Godmother died, we inherited her shabu-shabu pot because either no one knew what to do with it or they know I love to cook, or both. I think I need to dust it off and use it and maybe make some memories with my kids. Lisa! I knew we were kindred spirits! Can’t wait ’til our cooking paths cross again and we can share stories! BTW, I remember “head cheese” in our meat drawer . . . I steered clear of that one! LOL! Love reading this story Laureen. Feel so blessed to have had some of Hank’s cooking. And never has an Easter celebration been as amazing as the one spent with you and your parents. Watching your dad in the kitchen was exciting… sitting down to enjoy the meal was nothing less than spectacular! You have picked up where he left off and I am confident that he is smiling down on you… so proud of your accomplishments and the women/wife and mother you’ve become! Love you my friend!!! Jamie, My Friend! I just teared up reading your comment. I have such great memories of that Easter Dinner, too! I remember it well . . . we were both single mothers and we had our friends and kids running around (not to mention an “ex”–LOL!). Good times! Wonderful blog Laureen!! Can relate to so many things! Loved getting to know your dad and some of his food adventures! Have a nice weekend!! Laureen I loved your post! What a lucky girl you were to have been treated to such a variety of culinary treats. I grew up in an Irish meat and potatoes family…eating rice was considered exotic. Until I read this post I had never heard of a shabu-shabu pot! This tribute is amazing….sending you love.. Thanks, Laurie! Back to you! Oh Laureen this is so beautiful…I am sure you were crying when you wrote it…I was, just reading it. He certainly did teach you so many important things in life. You are such a kind and compassionate person. Don’t even need to mention your cooking ability! Thank you, Pam! I think of Dad all the time when I’m in the kitchen! Your kind words are making me tear up! Laureen, I’m already having a tear jerker weekend with the loss of my s-i-l but your tribute to your Dad has brought the tears on again. I’m sure he is in heaven looking down on you as you cook, participate in cooking contests, and now blog. He has lots to be proud of as you learned your cooking lessons and sharing with people well. Miss you. Thank you, Julie! I’m hoping our cooking paths will cross again soon so we can exchange Dad stories! Thank you, Tina! I am overwhelmed by all the kind words. I hope all is well in the Land Down Under! Please, let’s not lose touch! 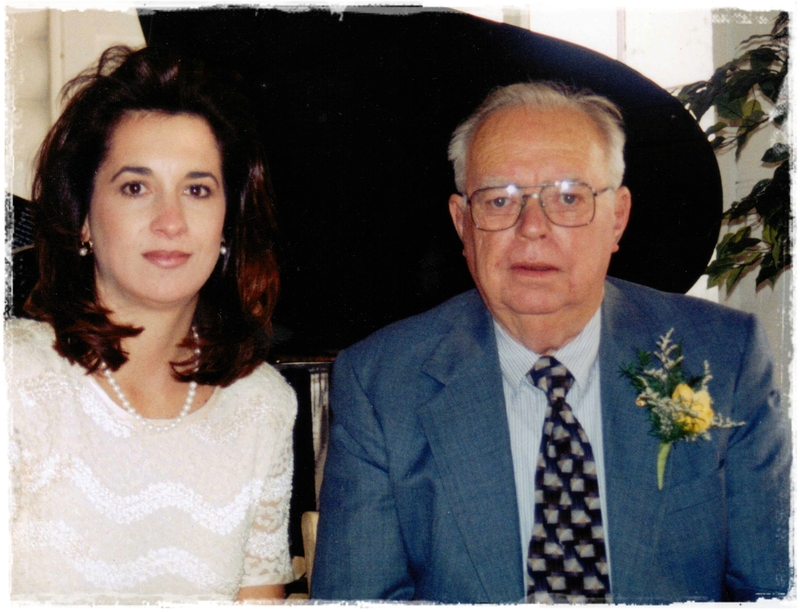 what a fantastic blog, and tribute to your dad, family and love,. You are truly a gifted and special lady Laureen. I am going to post your very moving blog to him to read. Kate, thank you so much for your kind words! Sounds like your dad expresses his love in the same way my Dad did. It’s wonderful, isn’t it? Thank you for sharing! Let me know if your Dad liked the post! I love this post, Laureen. I’m so lucky to have enjoyed some of Hank’s cooking, and our Thanksgivings and Friendsgivings are never complete until we have our taste of crispy skin, and lots of Hank’s gravy. Love you, and am so proud of you for following in your Dad’s cooking footsteps!! Awww, Denise! Love you! So glad we share our Friendsgiving each year. And every year, Hank is with us! When I was writing the part about sampling the crispy skin, I thought of you, of course! May we share the crispy skin for years to come! Awww, what a nice pre father’s day post. Great memories! My dad was from Croatia and we ate lots of “weird foods” compared to most of my friends. I particularly love your mention of the rhubarb. Brings back wonderful memories of my grandmother stewing it ( for lack of a better word) with sugar. I loved it best when it was still warm. The combination of sweet and tart was heaven!